Society often dictates that humans follow a defined path of norms. Some might say this is the road most traveled, made of bricks that have been compacted with the footsteps of mindless cooperation. We adopt another view: Go against the grain, find your own path, and when you need inspiration, always look to the ones in black. They’re the rule breakers, the non-conformists, and the counter culture. Black Shirt isn't just our name - it's our philosophy against convention and homogenization. It's who we are and what we strive to be - the ones that challenge the "norms" of the craft beer industry. Want to learn more about our history? Black Shirt Brewing Co. is featured in "Crafting A Nation," a documentary that focuses on the state of the local and national craft beer scene. The film highlights the struggles and successes inherent to running a brewery, with interviews from big-time industry players as well as up-and-comers, all uniting together to drive an industry that cares about shaping and supporting the communities they serve. Black Shirt Brewing Co. is honored to have been selected as the centerpiece for this film, and we welcomed the opportunity to provide a behind-the-scenes look at our brewery's transformation from the ground up. Available in the iTunes store and on Amazon Video, "Crafting A Nation" is a must-see for anyone interested in the art of craft beer and its ability to amaze, delight and transcend what's on tap. Located in the heart of the RiNo Art District just north of downtown Denver, Black Shirt Brewing Co. strives to offer an experience that strikes a harmonious balance between music, crave-worthy pizza, delicious craft beer and an exemplary guest experience. 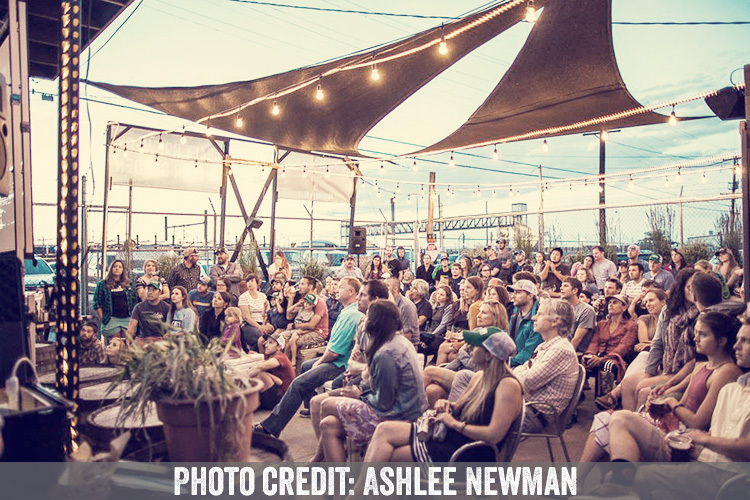 We’ve received accolades for our taproom patio (front and back), and in late 2017, we were awarded “Best Brewpub for Live Music.” Our urban Beer Garden features a hand-built, one-of-a-kind pallet stage that brings in acts from Colorado and beyond. And we’re mere steps away from the RTD A Line’s 38th & Blake Street station (the “Train to the Plane”), making it easy to swing by the taproom on your way to and/or from the airport. We love hosting parties here at Black Shirt Brewing Co. Looking for a space for a corporate training, private event, fundraiser, wedding reception, or birthday party? No matter the occasion, we have several spaces available for rent, so please see our space rental guide and let’s get your event booked! Sign up for our newsletter to receive the latest news on our upcoming events, beers, and special offers!